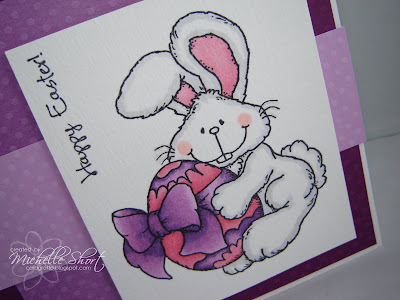 Happy Easter everyone, I hope everyone is having a nice long weekend. This is the card I made for my mum, I have used High Hopes Bunny with Gift available from Dies to Die for. I have have stamped him out and coloured with Copics, Elzybells message stamped at the top, cut out and added to base with 3d foam pads. 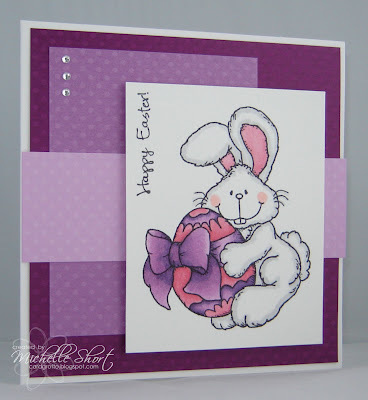 The base is various shades of Bazzill Dotted Swiss CS - also available from Dies to Die for. Papermania gem stones added to finish. STAMPS: High Hopes, Elzybells Art Stamps. INK: Memento Tuxedo Black. CS: Anitas, Craftwork Cards, Bazzill Basics. ACCESSORIES: Papermania Adhesive Gems, Copic markers. Another superb card Michelle and i'm sure that your Mum just loved it. Your new watermark is beautiful. Love this card Michelle! I'm sure you're mum loved it as well! An adorable card Michelle!! Happy Easter! what a beautiful card Michelle,l love the colour. So cute Michelle! Love how you've highlighted the bunny and the egg has been coloured superbly, great shading! Happy Easter to you, hope you have a lovely day!